Their first date took place at a trivia night. It went very well, so this is destiny. $500: Celebrating its 50th anniversary in 2017, George Balanchine's ballet triptych "Jewels" includes acts with all but which of these names? $1000: A Google Survey conducted by Mic.com found most 18-to-34-year-olds don't meet their significant other via a dating app, but instead meet them through what? $2000: FDR advisor Harry Hopkins is considered the chief architect of the landmark federal economic reforms commonly known as what? $3000: In 2005, Nepalese couple Moni Mulepati and Pem Dorjee Sherpa became the first people ever to get married where? $5000: Coincidentally, what star who's battled LeBron James in the NBA Finals 3 years in a row was born in the very same Akron, OH, hospital, 3 years after LeBron was? Ana only recognizes one of the names up there and asks Brian if any of the names say "basketball". He's not a watcher or a fan but one name is sticking out to him. MILLIONAIRE "QUESTION OF THE DAY": Popular during Victorian times, a "tussie-mussie" is an ornamental vessel that holds what at a wedding? $7000: You'll be seeing red, literally, when you cook what tomato-and-chili pepper-based sauce whose name is Italian for "angry"? Ana is happy with this question because she took Italian for a year and she also speaks Spanish. "Primavera" means spring, but Ana doesn't know what "marinara" means but thinks it's a meat sauce. "Arrabbiata" sounds like the Spanish "rabia" or "angry". Brian asks if Ana is "$7000 confident" in the answer; she says she is. 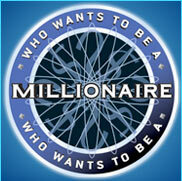 Brian and Ana will come back on Monday to finish their run up to the million. 5K: Thought Curry was more than 3 years younger, but guess him anyway.